One day my mother told me she had skin cancer and would be having MOHs surgery for the removal. Initially I was afraid it was something more serious like melenoma, but thankfully it wasn't. I also had no idea what MOHs surgery was. Matter of fact I had never even heard of it before. Id like to share her journey with skin cancer and educate the reader on the MOHs surgery and how it is used to treat skin cancer. 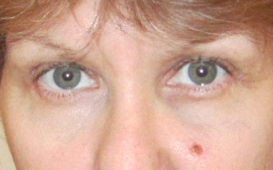 In Aug of 2012 my mother noticed a small, almost unnoticeable pimple on her cheek. Although it was not painful, she became concerned when it did not go away so she made an appointment with her dermatologist who ordered a biopsy. The biopsy came back as infiltrating basal cell cancer. Her dermatologist explained that infiltrating basal cell is a non-life threatening, but aggressive type of skin cancer. Although it rarely metastases to other parts of the body, it can be disfiguring if left untreated. With this type of cancer the pimple often resembles a "tip of the iceberg" with more tumor cells growing downward and outward into the skin, like the roots of a tree. These "roots" are not visible with the naked eye, but can be seen under a microscope. Since her dermatologist could not remove the cancer with confidence she was referred to a MOHs surgeon. What is Mohs surgery? Mohs Micrographic Surgery is a highly specialized and precise treatment for skin cancer in which the cancer is removed in stages, one tissue layer at a time. It is an outpatient procedure. Once a tissue layer is removed, the edges are carefully examined under the microscope by the Mohs surgeon. When cancer cells are seen, an additional tissue layer is removed only in areas where the cancer is still present, leaving normal skin intact. This saves as much normal, healthy skin as possible. Once the cancer has been removed, the Mohs surgeon will explain options for repair of the wound, including natural healing (granulation), suturing the wound together by a side to side closure, or using a skin flap or graft. The skin cancer is growing rapidly or uncontrollably¨ the skin cancer is of an aggressive subtype (i.e. sclerosing or infiltrating basal cell carcinoma). The cure rate of the Mohs technique is 99 percent for most skin cancers, considerably higher than that of other methods; it also provides the greatest chance of cure when other methods have failed. Mohs surgery will leave a scar. Mohs surgery preserves as much normal skin as possible and maximizes options for repairing the area where the skin cancer had been. Generally, a post-surgical scar improves with time and can take up to one year or more to fully heal. After stitches were removed . It has been two years since the surgery with the help of scar pads the scar is barely noticeable. She has not had a re-occurrence, but has had several other outbreaks. She attributes her skin cancer to heredity and sun exposure as a teen.